23/Jan/2017 Posted By admin no comments. Now going forward, in this blog-post, let us take you through the steps involved in automating the AMI backups and cleanups using AWS Lambda for ELB tags. Side Note: Above steps are quite similar to the previous blog but here we are focusing on the functionalities for ELB tags. Login to your AWS Management console, Go to Services, and click on IAM under Security & Identity. In IAM Dashboard, Click on Roles, and Create New Role with the Role Name: lamda-ec2-elb-ami-role; Select Role Type in AWS Service Roles as AWS Lambda then proceed to create a role. Go to Policies tab; click Create Policy and select Create your own policy (you can name the policy as lamda-ec2-elb-ami-policy). Paste the content (additional permission to ELB) of the following JSON in Policy Document, and click on Create Policy. Now that we have created a role and a policy, we’ll have to create the first function that allows us to backup by picking anyone instance from the attached (AWS) instances to ELB in our account, which has a "Backup" key tag. We don’t have to indicate a value here. The script will first search for all the load balancer’s having a tag with "Backup” on it. As soon as it has the load balancer’s list, it loops through each load balancer’s and fetch the instance ids for instances had been attached to the load balancer and put it in an array. Then pick the first index of instance id in an array list to create an AMI. Also, it will look for a "Retention" tag key which will be used as a retention policy number in days. If there is no tag with that name, it will use a 7 days default value for each AMI. After creating the AMI it creates a "DeleteOn" tag on the AMI indicating when it will be deleted using the Retention value and another Lambda function. So here’s how you can create your first function. Go to Services, Lambda, and click Create a Lambda Function: Login to your AWS Management console, Go to Services, and click on Lambda under Compute. Select Python 2.7 as a Runtime option. You’ll have to write a code next by considering the above mentioned points. Click Next and Create Function. While creating lambda function, make sure to choose the IAM role created earlier (lamda-ec2-elb-ami-role) and have specified sufficient memory and timeout configurations. Having successfully created the AMI using the previous function, we need to now remove them when not needed anymore. The script first searches for all load balancers having a tag with "Backup” on it. As soon as it has the load balancers list, it loops through each load balancer and refers the AMIs of that load balancer. It checks that the latest daily backup succeeded then it stores every image that's reached its DeleteOn tag's date for deletion. It then loops through the AMIs, de-registers them and removes all the snapshots associated with that AMI. So, you have 2 working functions that will backup AMI and remove those when "DeleteOn" specifies. And now, it’s time to automate using the Event sources feature from Lambda. We need to run at least once a day both. Login to your AWS Management console, Go to Services, and click on Lambda under Compute. 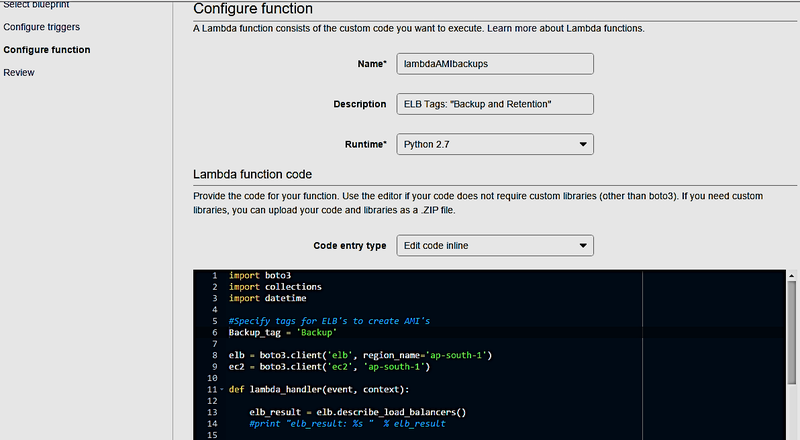 Click on Functions Menu on the left, and click on the function you want to schedule - lambdaAMIBackups for example. Go to Schedule Expression: select cron and modify accordingly with the schedule time. Having created AMI backup and cleanup functions and scheduling them, now it’s time to create a tag for the load balancers with a tag-key Backup with no value and Retention with retention days. Login to your AWS Management console, Go to Services, and click on EC2 under Compute. Select the load balancer you want to tag (test-elb, for example). Go to Tags >> Add Tags and add a tag with Backup with no value and with Retention value 4, for example. Here, tag-key “Backup” is used to identify the instance of load balancer for which the AMI has to be created and tag-key “Retention” with value “4” ensures that we retain AMI for 4 days and delete after 4 days. If the Retention tag is not used then, by default, it retains for 7 days. Now you can see the AMI created with tag-key “DeleteOn” with deletion date. This AMI will delete on the date shown in Value, only when there is a successful AMI created for that day. That’s it! We’ve successfully used AWS Lambda to automate AMI backups and cleanups for ELB tags. Easy? Isn't it? If you still face any challenge, drop a comment below and we would be more than happy to assist you further. If you have any feedback or insights to share with us, we’re just a click away. Nagarjuna D. N is System Administrator with BluePi Consulting.